Making a few small changes to how your home is decorated can make a big overall difference to how you feel when you get back from work and want to relax. Designers Guild founder Tricia Guild has long understood this. As well as being the creative force behind the company, she was written over a dozen books on interior design, on everything from soft furnishings to gardens. She has also won several awards in the process, including the Textile Institute’s Gold Medal for Design Contribution in 1989. This commitment to the principles of design has carried through to how the company operates and Designers Guild remains at the forefront of the online home furnishing business: dedication to quality products and a high level of customer services informs everything that the company puts out. Designers Guild is also mindful of its impact on the environment and many of the items it sells, such as fabrics and paper, are made from natural fibres that can be recycled. How do I use my Designers Guild Discount Code? Click on the discount of your choice and follow the link to the Designers Guild website. Add the items you want to your online shopping cart. When you’ve finished shopping, proceed to the checkout and add your discount code. If you’re a new customer, enter your email address and choose a password. Enter your delivery address and choose your shipping method. Choose whether you want a gift box. Review a summary of your order before entering your payment details and confirming your order. 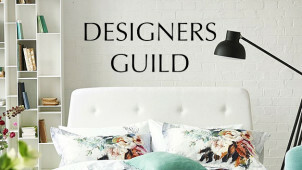 Sign up to the Designers Guild newsletter and be the first to hear about new products and offers. How do I track my Designers Guild order? Does Designers Guild deliver overseas? How can I find my nearest Designers Guild stockist? Find your nearest outlet here. UK Standard Delivery: 3 - 5 working days. £4.95 or free on orders over £250. Express Delivery: 1 - 2 working days. £7.95. Weekend Delivery: Saturday or Sunday. £9.95. If you’re not happy with your purchase, you have up to 30 days to return it for a refund. Further information can be found on the delivery and returns page. Do you have a passion for interior design? Or are you on the lookout for ways to transform your home or business? Designers Guild is a long-standing retailer specialising in wallpaper, upholstery, fabrics and furniture. A Designers Guild discount code could help you transform your home or business with inspiring and creative design ideas of the highest quality. Designers Guild has its own product lines and currently offers almost 9000 different fabrics and 2000 kinds of wallpaper. Designers Guild was founded in 1970 is run by siblings Tricia Guild and Simon Jeffreys. The company has almost 300 employees in the UK, Munich and Paris and alongside its online presence, has two London showrooms on Chelsea’s King's Road and on Marylebone High Street where you can pop in to view its impressive selection of fabrics and furnishings. Designers Guild has also expanded worldwide, with further showrooms in over 60 countries. While it’s certainly possible to transform your home by making dramatic changes - giving the walls a new coat of paint or changing the curtains, for example - there are also plenty of smaller things you can do that will still make a difference. You could put your Designers Guild voucher codes towards a new rug or quilt, or even just some new bed linen. There are tons of beautiful accessories like these on the Designers Guild lifestyle page.